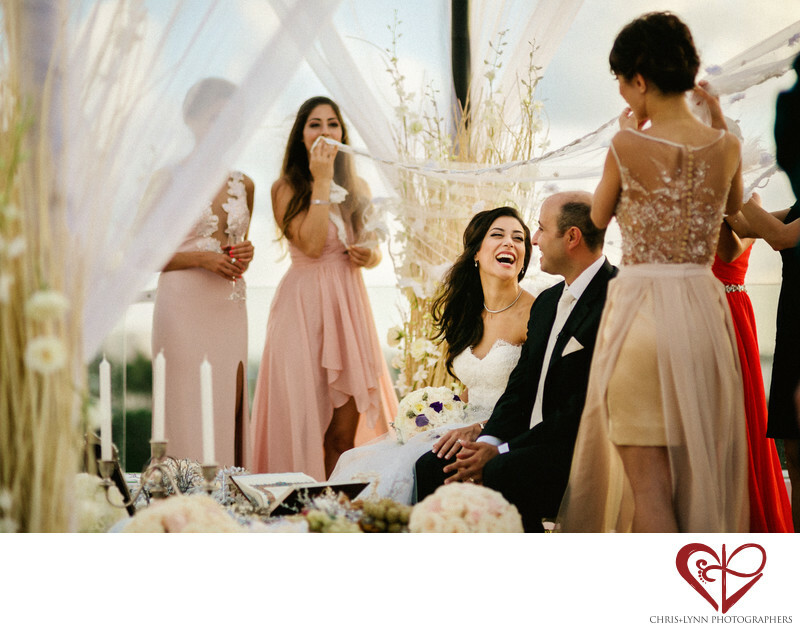 Cancun, Mexico has many breathtaking venues for Persian destination weddings. We love photographing at Le Blanc Resort and Spa because of its modern architecture, precise lines, and theme of white. These elements make it a blank slate for the design and decor vision for a bride or her planners. It is also a simple and elegant backdrop for a minimalist wedding. Some of our other favorite wedding venues for Persian destination weddings in Cancun are Nizuc Resort, The Ritz-Carlton Cancun, and Zoetry Resort. As photographers we love Persian weddings because the customs and traditions create so many opportunities to capture genuine emotion. Persian wedding ceremonies seem to always erupt in laughter when the women in the bride's life gather around the couple! I love the bride's look of pure joy during this ceremony moment. She truly looks so happy to be surrounded by the people she loves and to be marrying her groom. I love the way this image shows the emotion of the moment as well as the important elements of Persian ceremonies. You can see the candles, dates, holy book and other details of the Sofreh and you can see the glass of honey held by one of the bridesmaids. Location: LE BLANC SPA RESORT, Km.10, Blvd. Kukulcan, Zona Hotelera, 77500 Cancún, Mexico . 1/3200; f/1.4; ISO 200; 85.0 mm.